Georges Rochegrosse was abandoned by his father as a child, and when his mother remarried he became the stepson of the great poet Théodore de Banville. At the age of 12, he became a pupil of Gustave Boulanger and Jules Lefebvre at the Académie Julian, where he later taught draughtsmanship. While enjoying the benefits of the more liberal teaching at the Académie Julian, he enrolled at the École des Beaux-Arts, and was a finalist in the Prix de Rome competition twice. He painted murals for the staircase in the Sorbonne library. In 1883 he won the Prix du Salon, which enabled him to visit Italy. He subsequently travelled to Belgium, Holland and Germany. Around 1890 he married his great love Marie Leblond, who became the model for the heroines in his paintings for about 30 years. 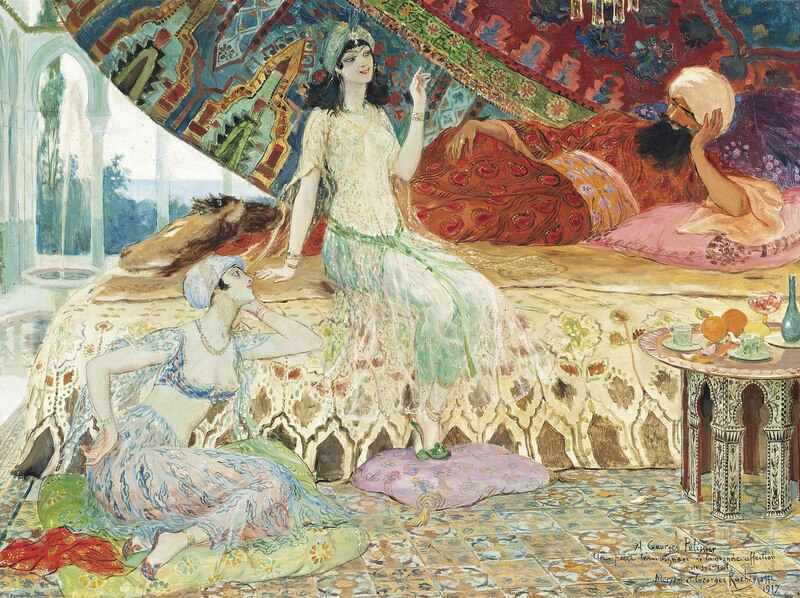 From 1900, Rochegrosse and Marie spent the winter months in El-Biar, in the hills above the Bay of Algiers, where the painter often found the Oriental backgrounds for his compositions. He died in El-Biar, but he was buried in Montparnasse Cemetery in Paris. He was made an Officier of the Légion d'Honneur in 1910. He was also a permanent member of the Salon jury. Now almost totally forgotten, in the 1880s and 1900s Rochegrosse was a fashionable painter. His fame was international, commensurate with the ambitious nature of his major historical, mythological and literary compositions. In Sherlock Holmes, Conan Doyle praises one of his paintings.